Yesterday Google revealed their new logo. But no, I am not writing about Google. That is just one cool news I want to share with you, hehehe. Okay, back to topic. This will be a post about Facebook vs Path. As Facebook is self-explainable, Path might be less popular to those of you who are not residing in Indonesia… or simply, to our non-Indonesian friends. 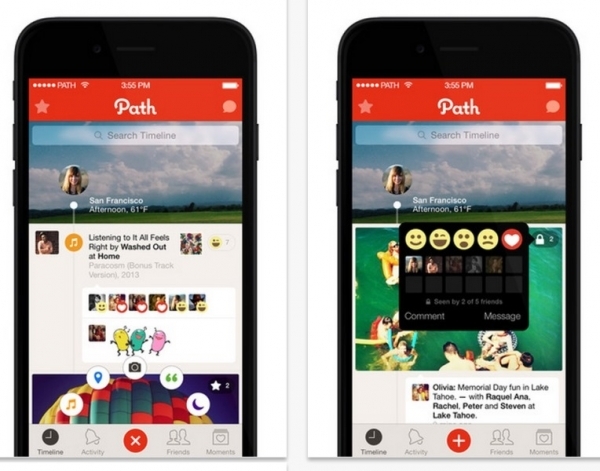 Path is a mobile based social network application (yes, can only be accessed via mobile) which allow a certain limit of friends. 150, to be exact. It allows you to post photos, videos, music you’re listening to, text/thoughts/status, and update your location. So it is like having Facebook, Foursquare, and blog in the same app. As per this article, it has over 5 million users in which 4 million of them are based in Indonesia. Path is very popular between Indonesian youth especially those in bigger cities. It is so popular in my network too, starting around 2 years ago. My friends were downloading Path app and began to post stuffs that only selected people can see. I downloaded it too and started to use it around the same time. At first, I became active in Path and started to ditch my Facebook account. With over 1000 friends in Facebook (in which half of them are “friends” who went to the same university, “friends” who I met in a seminar, etc), I found Path was more private and I felt more comfortable using it. But lately I realized something. I found that Path moments are most likely “gone” after you post it. Well, not gone literally, but its user interface makes it hard to recollect past moments. Unlike Facebook, it has no photo albums, so all the pictures you posted in Path are scattered. You actually can recollect past moments, but it involves a lot of scrolling. If you want to recollect past moments, you have to scroll all the way down to find the moment that you want to see. I found it inconvenient. Then I decided to go back to Facebook. I now understand why I like to post on social media and why I plan to keep doing so. I want to be able to recollect my past moments (that’s why I think Facebook’s “on this day” feature is a gem!). In Facebook I am able to see my past moments, even way back to 2008 when I was in still in college. This makes Facebook a win for me compared to Path. I mean, it’s even hard for me to recollect moments from my 2013 US Trip in Path (too much scrolling involved)! What about my privacy, you might ask. Well, that’s where Facebook’s circles come in handy. I have finished re-organizing my Facebook friends and categorised the remaining to several circles (ex. high school friends, close friends, colleagues, family, friends that I have met just once, etc), and have set my privacy settings accordingly. It was indeed a hassle but now that I’ve done it,I am able to post whatever I want on Facebook without having to worry that a stranger will see my, let’s say, my holiday pictures. When I’m bored or simply feeling nostalgic, I can browse through my profile and see my tagged pictures, old albums, or past memories. Plus, I can simply connect with my friends from my grad school days in the UK! Yay! So that’s why I chose to re-ignite my Facebook account and start to use Path less. What about you, which one do you use more often, and why? Kalo facebook masih aktif Non? Punya path dan feelnya kurang pas. Tdk terlalu aktif di medsos krn too much information..skrg mulai suka IG dan twitter. Same here! I prefer FB than Path. Path for me is just for my rubbish ranting hahaa and pictures that’s not important and good enough but too bad to waste😜 My Path’s friend I think is less than 70, I use Path to connect with my Indonesian friends mostly. Ah agree.. path is for pictures thats not important but too bad to waste hahaha. Totally agree with that sentence! Btw I dont think a lot of ppl outside of Indonesia use Path, no? Iya ya entah kenapa Path booming bgt di kalangan Indo padahal diluar biasa aja.. The very same reason Christa. Hihihihihihi. Ada yang bilang juga Path ga bisa dipake nyari duit. Hihihi. Lebih sering IG ya Nis? Iyaa skrg temen FB sudah berkurang dan dipilih yg bener2 kenal aja.. Sejak aku circle2in akhirnya bebas dr postingan aneh2 tapi ya gitu supaya “bersih” sedikit ribet sortir temen nya hehehe..
Iya kalo Path kayaknya cocoknya buat share kejadian saat itu yah..
Aku pake dua-duanya Chris. Path untuk inner of the inner circle, bisa puas nyampah disana. Temenku di Path hanya 70an gitu jumlahnya. Facebook fungsinya untukku sekarang seperti buku alamat. Handy untuk mengucapkan selamat ulang tahun ke teman, keluarga, ex colleagues, ex temen sekolah dll. Lebih sering online di Path sekarang. Facebook soalnya lebih bisa berinteraksi sama orang hehehe.